During February 2016, Willow Bend Environmental Education Center and the City of Flagstaff received a Heritage Grant to support wildlife watching programs, interpretive signage, and a new solar pond aerator at Frances Short Pond. 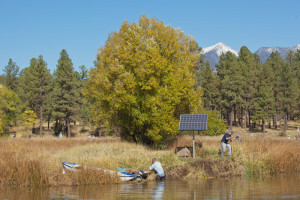 As project partners, the Friends of the Rio will help contribute to on-going restoration projects and environmental education in collaboration with Willow Bend, the City of Flagstaff, and FUSD. For more information, check out this news article.